Ann reveals the secrets of her atmospheric, inspirational landscape paintings, which really push the boundaries of what can be achieved with watercolour.Following the success of Experimental Flowers in Watercolour, she now explores ways to interpret the landscape. Packed with stunning examples of her colourful, atmospheric work, this book encourages you to experiment with the same techniques in your own painting to develop a personal style. Experiment with a range of innovative and exciting techniques, from expressive mark making and flowing watercolour to building a range of textures using unusual materials such as granulation medium, sand, salt, cellophane and found objects. Techniques covered include combining waterbased paint and ink with other media such as gesso and collage to create dramatic effects; manipulating paint with materials such as plastic wrap; tearing, layering and reassembling paintings into watercolour collages; and developing textures and marks made using fabrics and organic materials. Throughout the book Ann offers her personal commentary on how the paintings were created, giving us a unique insight into the mind of the artist. 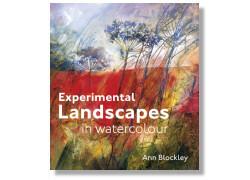 Packed with practical advice on thinking creatively and how to develop semi abstract textures in your paintings, Ann Blockley’s glorious book is an inspiration to all landscape painters and the ideal companion for watercolour painters who want to take their work a step further. There is a companion DVD to this book see details here.